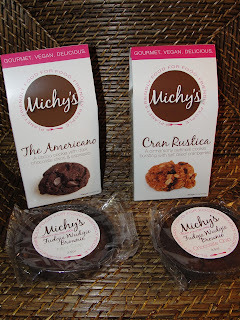 Here is my thoughts on some products by the brand Michy's Foods. 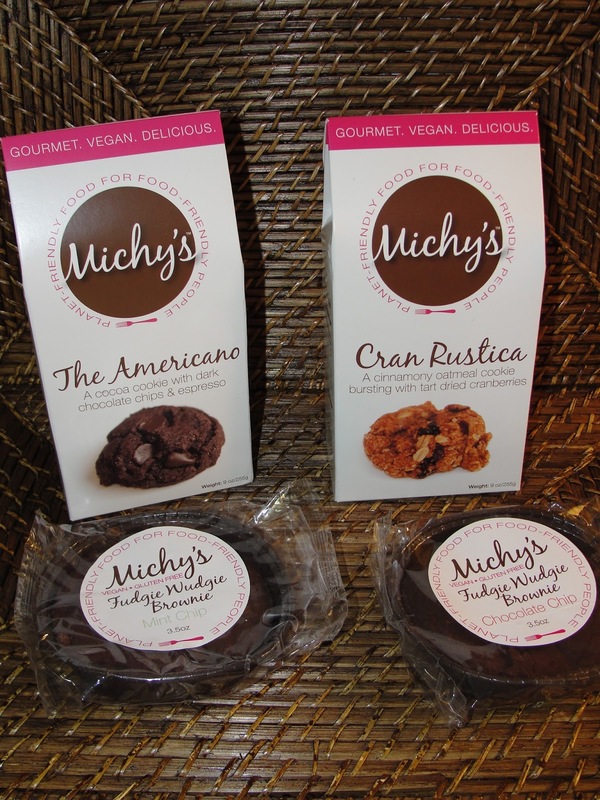 Michy’s was founded with the intention of helping people make better choices about the food that they eat, while proving just how delicious “good for you food” can be. 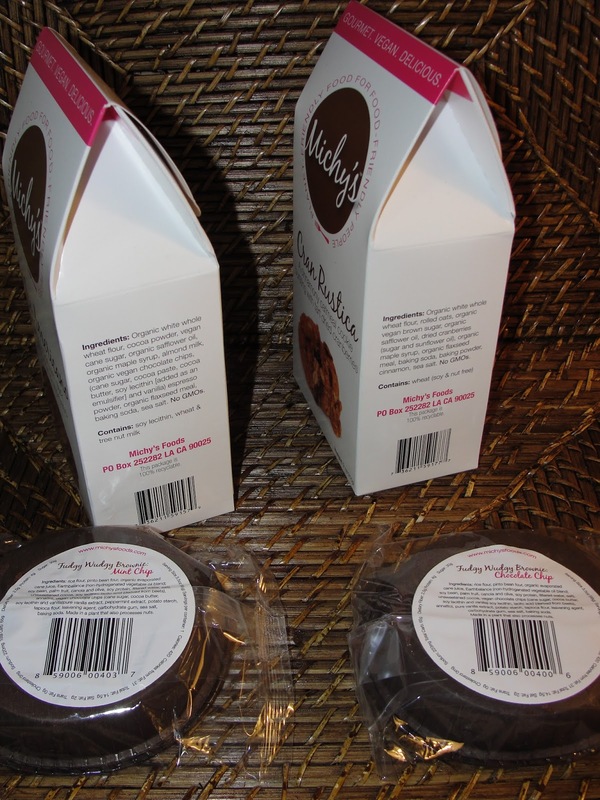 All of our cookies, cupcakes, muffins and cakes are 100% vegan, made with whole-wheat flour, unrefined sugar, safflower oil and flaxseed meal and we avoid the use of genetically-modified ingredients. I feel confident sharing these treats with my family and am honored that you¹ve decided to share them with yours. We hope you become a lifelong member of our Michy’s family. A cocoa cookie with dark chocolate chips and espresso. This is a nice soft-chewy brownie like cookie, the hint of espresso is divine, perfect for that morning cup of pumpkin spice latte. A cinnamony oatmeal cookie bursting with tart dried cranberries. Delicious, the mixture of cinnamon, oatmeal and cranberries go so well! You can really smell the maple syrup in this one, very warming and yummy fall-like. Our original Fudgy Wudgy Brownie; rich & chewy, speckled with dark chocolate chips. 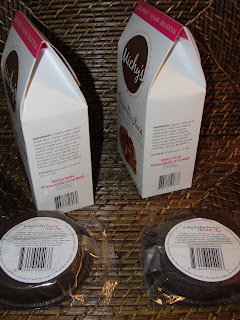 Brownies are my favorite thing, I like that they are individually wrapped so they are nice to have on hand or in your purse if you get hungry while shopping, nice treat! A symphony of cocoa, dark chocolate chips & peppermint; simply divine! This Mint Brownie is very good! I like the dark chocolate chips! I would love to see this little company expand to have more gluten-free options. Along with it would be nice to see it being soy-free too, because soy is a allergy for many! Brand image and design is very nice, looks very warm and homemade, I love that, it's what caught my attention about the company. For the packaging, I wish they make it into a more stronger packing, rather than a little bag that all the cookies are in, because many get broken, individual wrapping would be great addition to see!